The amount of Rinjani mountaineers increasing in this past 2 years. 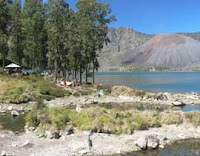 Facilities around Rinjani became the attractive power. Rinjani become more popular in world wide. The Rinjani management as tourist area got international award. The award was gave from National Geographic Society and Conservation International for Destination Stewardship category. 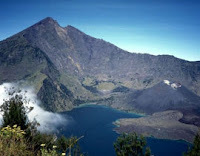 Since last couple years, Rinjani was managed by Badan Pengelola Rinjani Trek (BPRT) and a consultant from New Zealand. Ranjani area itself was part of the Taman Nasional (National Park). This mountain has 3,726 meter height and located at west, middle and south Lombok. Rinjani was managed together in this area. Previously, there are many complains from tourists who climb Rinjani. They report that they have been robed or got unpleasant treatment. Of course this situation adverse not only the tourists but also people who live around Rinjani. People involvement has been proved can handle those problems. For you who love adventure, Rinjani is quite challenging. There are several routes to get to the top of Rinjani, such as Senaru, Sembalun Lawang or Sesaot. Usually, you need three or four day trip from the last village to the top of the mountain. How long the trip was depends on the situation and condition in the field and the route you choose. One of the favorite route is Senaru. Senaru is small city at North of Lombok island. The distance between Mataram and Senaru is about 89 kilometers or less than 2.5 hours journey. You can reach Senaru by using motor vehicle. The road is pretty good. Cross the mountain range and the shore side to Senaru made an impression on. For example, at Pusuk, you can find long tail monkeys at the side of the road. Those monkey become friendly if you give them food. There are lots of Hotels and villas in this area. From Senaru, you walk to Babanan (next caldera at North), then go to Kokok Putih river. It’s one hour trip by walking. You can see telaga Segara Anak (a lake) before the summit. After that, you can choose which route you take to go to the top. The most route taken by tourist was through Senaru, coz this was the easiest way. You can access another route such as route Sembalun Lawang. Sembalun Lawang is a small city at the east of Rinjani mountain. The distance between Sembalun Lawang and Mataram is about 110 kilometer or 4 hours trip by using motor vehicle. Continue the journey from Sembalun Lawang to the west, to Segara Anakan is about one day trip. Then go to Plawangan baru to the top of the mountain. Sometimes mountaineers go straight to Plawangan and go to the top. Sembalun Lawang Route is the hardest route. Other alternative is Sesaot. Distance between Sesaot and Mataram is about 21 Km or a half hour trip using motor vehicle. From Sesaot we go to the Babanan then go to Kokok Putih. It’s two days trip, crossing mountain range and jungle. For those who love the nature scenery, the journey from Sesaot to Kokok Putih has the most beautiful view. After reach Kokok Putih, we go to Plawangan and then go to the top of Rinjani. Beside those three routes, many mountaineers improve new route by themselves. People around Rinjani also often hike the mountain with different route. Although they choose different route, at the end they must be meet the same point, Plawangan. 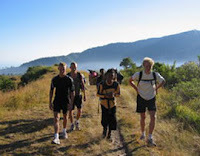 From Plawangan (also known as Plawangan Sembalun) we cross footpat and climb a steep hill. Mountainers call this area as 'Tanjakan Penyesalan', means regret steep. Guide or porter is available here. Guide and porter can help you prepare your daily needs, such as food and beverage or keep your stuff when go leave the place for take a rest. At Senaru, there is place for you to rent tent and sleeping bag. From Senaru, we can see culture trip, such as see the tradition of Sasak people which also known as Waktu Telu community. In this village, we can see their house that established orderly, and built with no nail at all. Not far from Senaru, there is other natural tourist object, a waterfall : Sindang Gile and Tiu Kelep.